KABUKI theaters, being theaters, require marquees in the same way as the halls of London’s West End, New York’s Broadway, or the burlesque joints in the 400 block of East Baltimore St. — The Block — in Baltimore, where I grew up. But as with everything else, the Japanese have their own approach to the whole business of marquees. 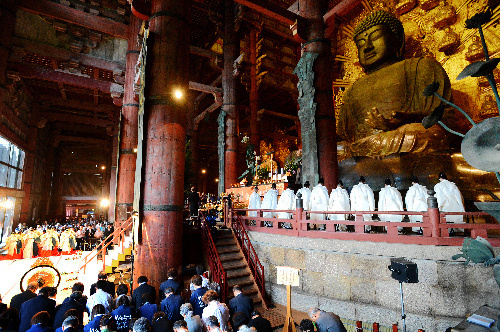 The photo above shows 78-year-old Kawakatsu Seiho and the 54 maneki (literally, invitations) he drew with the names of the performers of the season’s dramas staged at Kyoto’s Minami-za this year. Mr. Kawakatsu had just finished a special ceremony called the manekigaki (writing the invitations) at the Myoden-ji Buddhist temple in Kyoto (established in 1477) before the performance of Kichirei Kaomise. There’s more to tradition even if it does meet your eye. The style of calligraphy is unique to maneki of this sort, and is called kanteiryu. And because this is a special occasion, sake was mixed with the ink. That isn’t just for the heck of it — they say it adds luster to the ink on the boards. Don’t miss a trick, do they? 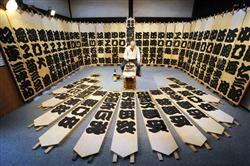 The maneki are 180 centimeters long and 30 centimeters wide and hung above the theater entrance. 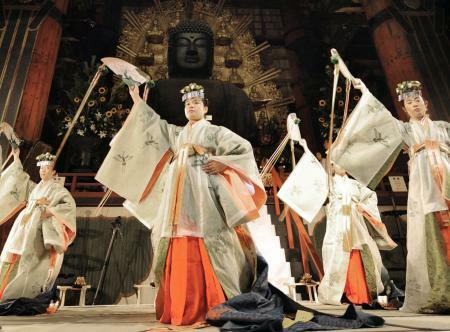 If you want to see what they look like in place, try the following amateur video taken three years ago at the premiere of the same drama at the same theater — Japan’s oldest, founded in the early 17th century. The cameraman could have been more relaxed, but the video provides excellent views of the exterior and interior both. Looking at the various responses to (Osaka Mayor) Hashimoto (Toru), what stands out are the people who say, “The writers and voters who support Hashimoto are just as bad as he is because they overlook his drawbacks as a politician and his mistaken policies.” I have the feeling that those same people who also support the anti-nuclear power demonstrations are capable only of factional or anti-establishment views. The people who say things such as, ‘Those voters who support Hashimoto and his mistaken policies have some screws loose,” should reflect on just how elitist, condescending, and dictatorial their way of speaking is. The type of people who say that Hashimoto is a dictator probably don’t know that the decision-making process in One Osaka is surprisingly decentralized, and closely resembles the Liberal-Democratic Party system. They also probably don’t know there is a faction-like subgroup within One Osaka that tends to keep Hashimoto at arm’s length. I have different problems with some One Osaka policies, but I also think it is extremely dangerous to make these excessively factional, subjective, and bullying statements about One Osaka before conducting policy debates. At this rate, I can see only unproductive results, regardless of whether One Osaka wins or loses (national elections), with democracy suffering the greatest harm. The public’s will is not the commotion in front of the Kantei, but demonstrated in the procedures of democracy. For a person to run for governor by shouting about the minor issue of abandoning nuclear power is nonsense. Mr. Hashimoto (Osaka mayor) had the judgment of an adult (when he agreed to the resumption of operations at the Oi power plant)…Even former comedians can win local elections. The anti-nuclear power movement has less strength than show business personalities. DOUBTLESS you have read either the articles or the headlines trumpeting the story of the thousands of people who surrounded the Diet building on Sunday to protest the restart of nuclear power plants in Japan. The RSS feed coughed up more than 30 articles on the subject yesterday and today. One image the journos particularly liked was “anti-nuclear protestors form human chain around Diet building”. There was no mention of the other productive activities they engaged in, but shouting loudly was probably one of them. You’ll have to dig a little deeper in the English-language media to find articles about the real demonstration of functioning democracy yesterday in regard to the issue of nuclear power, however. Here’s a hint: They weren’t playing ring-around-the-rosie in Tokyo. There have been two gubernatorial elections in Japan since Prime Minister Noda authorized the resumption of nuclear power generation, and both times one of the anti-nuclear power candidates tried to turn the balloting into a single-issue referendum. The first was held earlier this month in Kagoshima, where the anti-nuke challenger lost by a 2-1 margin. 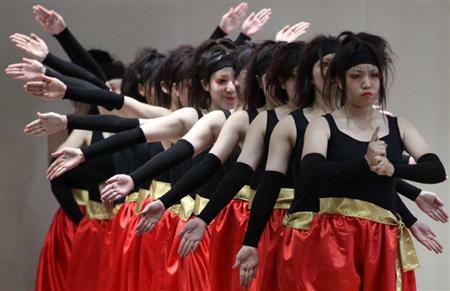 The second was held yesterday in Yamaguchi. That election attracted much more media attention, both in Japan and overseas. The interest was due in part to the participation of Iida Tetsunari, the founder of the Institute for Sustainable Energy policies. Mr. Iida is one of those fellows whose priority is to keep his eye on the main chance, and he’s leveraged his slippery ambition into public prominence for his anti-nuclear energy positions and theories. He likes generation using biomass materials, the sun, and the wind. The Yamaguchi election presented the opportunity of an excellent platform and bully pulpit. The current governor was stepping down after four terms, and the early favorite was the uninspiring, 63-year-old ex-Land, Industry, and Transport bureaucrat Yamamoto Shigetaro. Chugoku Electric Power plans to build a new nuclear plant at Kaminoseki in the prefecture. Mr. Yamamoto supported the idea, so that set up the perfect confrontation. He was backed by the bad old Liberal Democratic Party, now in the opposition, and their New Komeito allies. In contrast, Mr. Iida is 10 years younger, 10 times more photogenic, a media sweetie, and had the support of Sakamoto Ryuichi and other show business personalities. The qualifications and exit ramps in that statement are obvious, but in any event, he seldom addressed the issue during his campaign. He concentrated instead on promises to revive industry and create employment by building ports, roads, and other infrastructure. In contrast, Mr. Iida talked about little else, though he did try to tie that to a program of overall reform. He also came out strongly against the deployment of the MV-22 Osprey aircraft to a U.S. Marine Corps Air Station in Yamaguchi. That deployment created strong opposition, both in Yamaguchi and nationwide, because of safety concerns about the aircraft and the planned low-level training flights. In other words, he had the wind of the media and show business culture at his back, and he chose to sail on the tide of opposition to controversial policies. Another factor worth noting is that Elmer Fudd Yamamoto had 27 Twitter followers while Iida the Cool Guy had more than 60,000. Twitter is used more frequently in Japan than it is in the United States to disseminate political messages. It appeared an upset might be in the making. After all the whiz-bang and pixel shooting, Mr. Iida’s 35% of the vote was roughly the same as the now-forgotten anti-nuclear energy candidate in Kagoshima. The people are speaking, but some other people don’t want to hear what they’re saying. 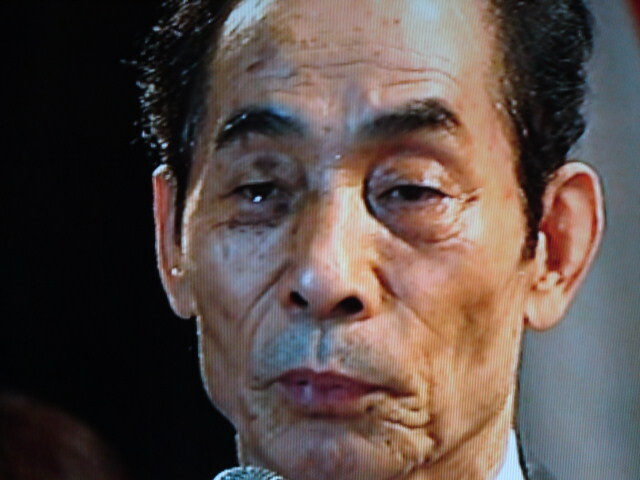 Thus, the man who framed the debate in Yamaguchi was Yamamoto Shigetaro. If Iida Tetsunari could not turn nuclear power generation into the National Vibration with all that free PR and show biz mojo, it’s not going to happen. Incidentally, the man who finished a distant third, Takamura Tsutomu, was a lower house MP from the ruling Democratic Party who resigned his seat to run for the office. (Another election must be held by next summer, and many DPJ MPs know it’s time to start thinking about a career change in anticipation of being relieved of their duties.) Mr. Takamura was also one of the 28 members of the small faction headed by Prime Minister Noda, but neither the prime minister nor any other DPJ bigwigs came to Yamaguchi to campaign. They knew it was pointless. Most interesting was that two of Mr. Iida’s former associates also failed to make the short trip to Yamaguchi to stump for him. 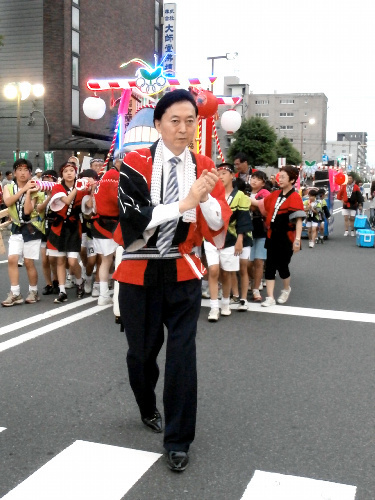 They were Osaka Mayor Hashimoto Toru and Osaka Governor Matsui Ichiro, both of the One Osaka group. Mr. Hashimoto is known for having a Kitchen Cabinet of prominent advisors on his payroll, called “brains” in Japanese. Iida Tetsunari was his energy policy advisor, and was perhaps influential in the mayor’s initial opposition to the resumption of operations at the Oi nuclear power plant in Fukui. Shortly after Mr. Hashimoto changed his mind and agreed to the plants’ restart, Mr. Iida resigned to run for Yamaguchi governor. Many wondered whether the mayor cut him adrift after he had served his purpose, or whether Mr. Iida saw the kanji on the wall and split while the splitting was good. Everyone was interested in watching what help Mr. Hashimoto or Mr. Matsui might provide to their former associate. It’s fewer than three hours by Shinkansen from Osaka, were they inclined to visit in person. 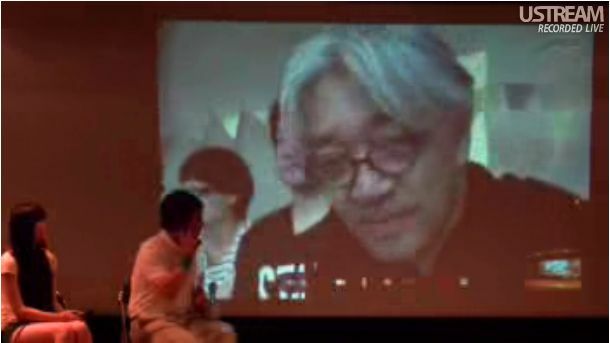 They might also have offered remote support with a video hookup of the sort Sakamoto Ryuichi used, as shown in the photo above. Neither man came to Yamaguchi or appeared live on video. That’s because neither man endorsed him. Perhaps one reason for the cold shoulders is that Mr. Iida is more controversial, and the subject of more legitimate criticism, than the English-language media knew existed. Ishii Takaaki, a freelance journalist who writes about science and technology, has explained the reasons for the controversy and criticism in detail. Mr. Ishii has followed the Iida career closely and has interviewed him several times. He said that he once respected him for his views — until 11 March last year. He has referred to Mr. Iida as a “trickster”, a good public speaker adept at presenting black-and-white frames for his policies, but who also spoke out of both sides of his mouth – one side for government officials, and the other side for anti-nuclear power radicals. In a column published last night, Mr. Ishii dismissed the candidate and his campaign as revealing the limits of “typical citizen activism”. He noted that while no power industry reform is going to happen without the cooperation of the power companies, Mr. Iida spent most of his time bashing them to win media applause. He charged that a favorite Iida technique was to spread false rumors among the public, creating greater confusion. He also added that “people involved with energy-related issues” knew of the energy advisor’s negative influence on Osaka policy, and that his extremism caused (unexplained) difficulties on the Kansai-area committtees of which he was a member. * In the near future, nuclear energy will be supplemented by natural energy. * Japan has sufficient energy now. * There is a conspiracy of the nuclear power interests. * Europe is the ideal. * There is a lot of “hidden energy” in Japan. Another indication of the forked Iida tongue was a brief flap over his membership in the Japan Institute for National Fundamentals as a research fellow since October 2009. Prominent members of that think tank include the former news reader Sakurai Yoshiko and freelance journalist Yayama Taro. They are conservatives who think Japan should actively pursue its national interests internationally, including the TPP negotiations. They are also not the sort of people the Asahi Shimbun editorial staff or Sakamoto Ryuichi would want to hang out with. When it was brought to his attention that his name was on their Japanese-language website, Mr. Iida denied that he had ever been associated with the group. The institute quickly responded with a statement that said it was not possible they would accept anyone without their consent. Mr. Iida then remembered that it had slipped his mind. Didn’t waste any time jumping into their narrative, did they? Opposition to nuclear power is such a powerful issue that it’s even beginning to appeal to the inakappe who make a living by putting food on everyone else’s table. The veil covering the superior attitude slips with the use of “enclave”, which has the meaning of a group or area different from its neighbors, either politically or ethnically. It most often describes territory that is alien to its surroundings. It’s unlikely that Tabuchi has spent much time there, unless she took an expense-paid trip to hear an Iida speech. The newspaper missed an opportunity to unload another dump on the place when they failed to mention that the largest city, Shimonoseki, is home to Japan’s whaling fleet. Speaking of ports in this enclave in a rural corner of Japan, Shimonoseki is also one of the terminals for two separate ferry lines to South Korea (a three-hour trip) and China both. As we’ve seen, Mr. Iida failed to turn it into that referendum, but if they insist on viewing it that way, the votes are in. This was followed by a long paragraph of LDP bashing and explaining their role in nuclear power plant construction. While predictable, it’s also pointless: the demonstrations were touched off by the current DPJ government’s moves to restart the generators. Sleepy, eh? Bright young energetic man with progressive ideas shakes awake the denshakan (田舎漢) and brings them into the 21st century. With all the snot in this piece, Tabuchi must have had a cold when she wrote it. If his campaign “took off” so explosively to reach the 35% level in voting, Yamaguchi’s sleepy ones must have been the anti-nuclear power forces. She doesn’t mention who was doing the going-to, and after today, she never will. The compulsion to corral stray college profs and self-declared experts to act as media mouthpieces and cite them as “go-to” sources is closed-loop self-absorption, not news reporting. The obvous lesson is that the objects of contempt are the true reality-based community the sophisticates presume themselves to be. They know what works and what doesn’t because their survival depends on it. The fashion statement of “Split wood not atoms” isn’t a survival choice, and hoping the wind blows and sun shines won’t be for some time yet. Many nuclear energy critics like to say that “lives are more important than money”. 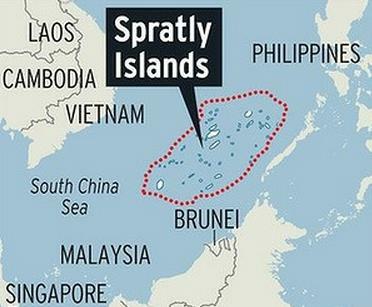 Perhaps they should be given an enclave of their own to see how life goes when they don’t have any money. The driver of the anti-nuclear energy movement is emotion — actual facts are unwelcome. All emotional issues tend to wane with the source of the emotional stimulation. As the memory of Fukushima recedes, and normalcy is once again defined by the absence of once-in-a-millenium disasters, so will the movement. In the meantime, it is possible that some of the politicians bandwagoning on this issue — Hatoyama Yukio, Ichiro Ozawa, Your Party — will recede from the movement themselves now that they’ve read the election returns. It will be left to the radicals to carry on. * Perhaps now the election results and the comparison of the number of Twitter followers for the two primary candidates will help debubble the froth about the triviality that has been exalted with the term “social media”. Well, that and the Facebook IPO flop. In other words, opposition to nuclear power in Japan is a Gray Panther issue. The Mainichi poll also shows that support for the Noda Cabinet is the lowest they’ve recorded at 23%. That rate’s been in the 20s for a while, so nuclear power is not the reason for those numbers. * One of the few DPJ politicians who openly endorsed Iida Tetsunari was Diet member Hiraoka Hideo, who was also the Justice Minister for all of four months until January. He was replaced in a larger Cabinet reorganization, in part because it was revealed that he chose as an aide a man with a criminal record. 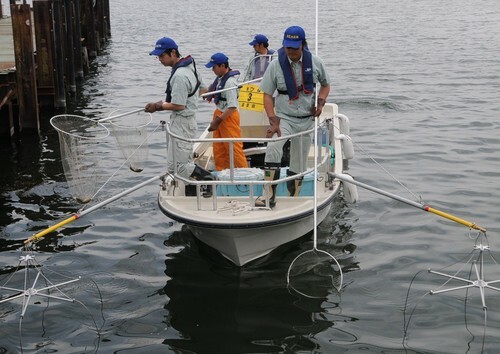 Mr. Hiraoka represents a district in Iwakuni, where the Marine Air Base is located. In other words, he might as well be wearing a sandwich board proclaiming his ethnic heritage (or, at a minimum, his political funding sources). That says quite a lot about Mr. Noda’s choices for Cabinet, designed in part to balance the party’s internal factions rather than select quality people. It also says quite a lot about the DPJ itself. Mr. Hiraoka, incidentally, won his Diet seat outright in the last election. You never can tell the sort of people the hayseeds in backwater enclaves might vote for. Iida Tetsunari wasn’t one of them. Speaking of energy flows, here’s Sakamoto Ryuichi letting his fingers do the talking instead of his mouth. 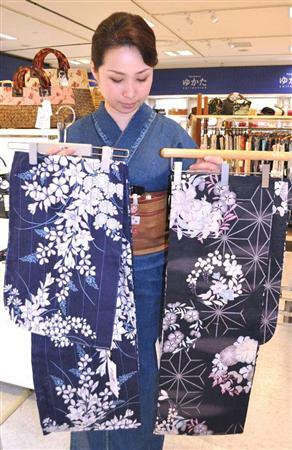 Shopping for yukata in a department store. 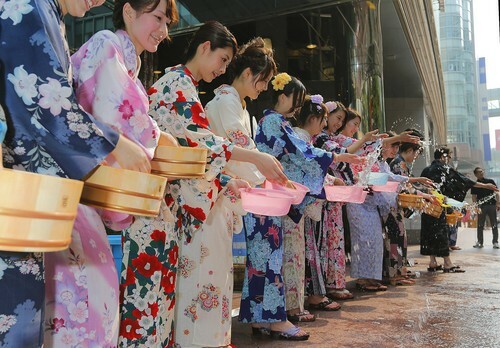 The summer kimono/robes are said to be the origin of Hawaiian shirts. Whenever I say nuclear waste should be exported to Mongolia, I am hit with a barrage of criticism. I wonder why that would be. Mongolia, a poor country, would assume the expenses for disposal, and they have plenty of places to dispose of it. Japan and the United States could remove nuclear wastes from their countries, and it would be cheaper than spending the trillions of yen on disposal facilities. It would be profitable for both sides. Why do people have such an aversion to the market? * This is not the time to be saying, ‘The students are bad, the teachers are bad, the board of education is bad, the parents are bad.’ Everyone has to conduct themselves properly. – Koshi’ishi Azuma, head of the Democratic Party delegation in the upper house, and former primary school teacher and official in the Japan Teachers’ Union, on the suicide of a junior high school student who had been bullied by his classmates. * That statement beggars belief. A precious human life has been lost. There must be a thorough inquiry to determine the problem and the responsibility, and prevent a recurrence. This seems to me as if Mr. Koshi’ishi’s statement is to protect his colleagues at schools and the board of education, and to cover up the problems with the Japan Teachers’ Union, whose education in human rights is extremist. 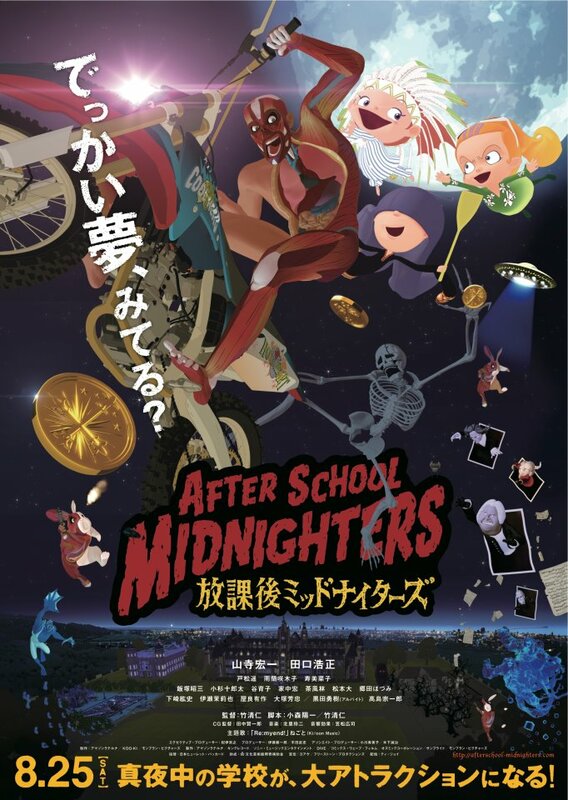 Everyone seems to like NHK specials. I’ve made NHK specials, and I don’t watch them because they contain no information you can’t read in a newspaper. They might be useful for people who don’t read newspapers because they summarize information in an easy-to-understand manner.